JOHN Hughes has revealed that goalkeeper Scott Flinders is the subject of prying eyes. 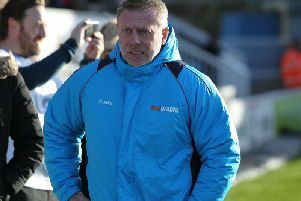 For now, however, the Pools boss is grateful to have him manning the posts for Hartlepool United. Flinders is the sole candidate when it comes to nominating a player of the season thus far. And he was again imperious during Saturday’s 3-1 win at Portsmouth. With the game goalless he pulled off a quadruple save, allowing his comrades to break upfield and fire the all-important opener. But with Flinders’ form comes attention from elsewhere and several Championship and Premier League clubs have cast an eye over the 26-year-old in recent months. Pools are readying themselves for an approach and the chances of Flinders remaining at Victoria Park beyond this season are slim. Hughes, though, is relieved to have the Yorkshireman as his No.1, and points to his weekend heroics as evidence of his worth. “Scott underlined his value on Saturday,” he told SportMail. “The saves he made were so important, it keeps you in the game. Hughes went on: “I know there are a lot of clubs looking at big Scotty. “It’s no surprise others are looking at him and we’re just grateful and thankful that he’s in goal for Hartlepool. Hughes took Flinders to Falkirk in a loan deal from Crystal Palace in 2008. And the Scot believes the stopper is much improved from those days north of the border. “I worked with him four years ago at Falkirk and he is 10 times the goalkeeper he was up there,” he said. “He has a great maturity and a real confidence about him. “He’s a real hard worker – he wants to come in and get a sweat on and get the best out of himself.